Midlife can be a woman’s halftime celebration. Not only can it be an opportunity to reflect on and rejoice in the life you’ve lived, but it is also a good time to plan your strategy for the future. 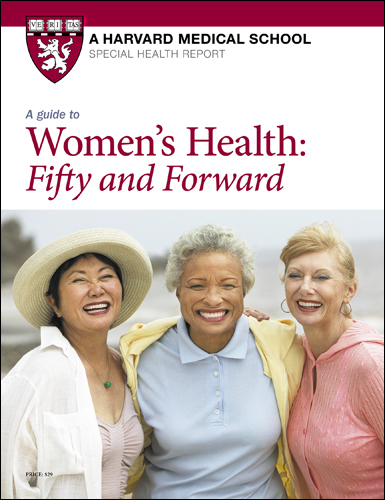 A Guide to Women's Health: Fifty and forward will help you determine the conditions for which you are at greatest risk and do your best to avoid them. It will also help you to better manage chronic conditions that may erode your quality of life, and to deal with physical changes that are more bothersome than serious. It is designed to give you the information to make the choices today that will ensure you the best health possible tomorrow. Midlife can be a woman’s halftime celebration. Not only can it be an opportunity to reflect on and rejoice in the life you’ve lived, but it is also a good time to plan your strategy for the future. It’s impossible to envision the second half of life without thinking about your health, especially your risk of developing debilitating or life-threatening diseases in the future. Around age 50, the medical decisions are changing and coming more frequently — when to have a mammogram, colonoscopy, or bone density test, for example. You may be trying to decide whether to have bunion surgery, or a knee replacement. Or you may be puzzling over the best way to manage your arthritis or irritable bowel syndrome. Women’s health studies have shown not only that women are different from men physiologically and emotionally, but also that it’s never too late to feel better by living better. This report focuses on health, not disease. It won’t tell you how to get the best treatments for serious conditions. But it will help you determine the conditions for which you are at greatest risk and do your best to avoid them. It will also help you to better manage chronic conditions that may erode your quality of life, and to deal with physical changes that are more bothersome than serious. It is designed to give you the information to make the choices today that will ensure you the best health possible tomorrow. Prepared by the editors of Harvard Health Publishing in consultation with Hope Ricciotti, MD, Associate Professor of Obstetrics, Gynecology, and Reproductive Biology, Harvard Medical School, Beth Israel Deaconess Medical Center. 53 pages (2016). If you are in midlife or later, you’ve probably already experienced some signs of aging: your joints may ache, your skin may feel dry, and you may not sleep as well as you used to. Midlife is also a time when the risk of degenerative disease starts to climb. Many of the chronic conditions that begin to plague women in midlife are due, in part, to declining levels of estrogen, which helps to maintain tissues in the body’s reproductive organs, and also in the breasts, brain, bones, bladder, and cardiovascular system. Genetic makeup is also complicit, as are the cumulative effects of normal aging, environmental forces, and lifestyle choices. 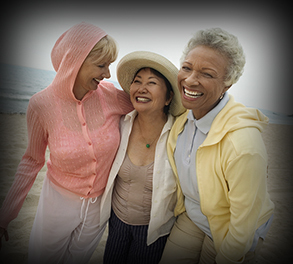 Mortality statistics from the Centers for Disease Control and Prevention (CDC) illustrate how the leading killers of women change with age (see Figure 1). Notice that cancer remains the leading cause of death until the eighth decade of life. Because the specter of malignancy hovers, women are more likely to name breast cancer than any other single condition as their top health fear. In reality, more women die of heart disease, although they tend to do so later in life. This diagram shows the top 10 causes of death (expressed as a percentage of total deaths) in women at different ages. You can see how the risk of the three leading killers for all ages combined — heart disease, stroke, and cancer — changes with age by following the red, yellow, and pink boxes. Chronic lung diseases include asthma and chronic obstructive pulmonary disease (COPD), which includes bronchitis and emphysema. Septicemia refers to blood infections.